It was so beautiful out today that I made any excuse to be outside... How about taking a few pictures of one of my WIPs outside? Sure! 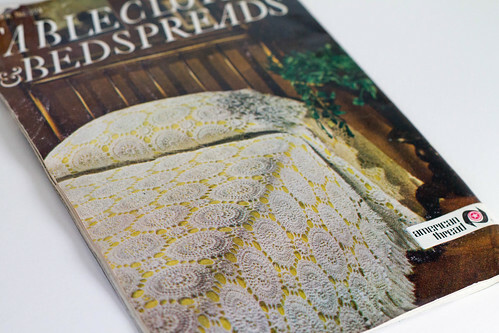 Actually, this project started as an experiment to see if I could take this gorgeous vintage bedspread pattern (Peach Tree Street from Star Book No. 224, Tablecloths & Bedspreads) which is written for size 10 thread, and make it in acrylic worsted weight yarn. The pattern called for a number 8 or 9 steel crochet hook to be used with the size 10 thread. In general, a number 7 is used with that thread. So, since I usually use a 6mm hook with this acrylic yarn, I went down to a 4mm hook. I think it worked great. 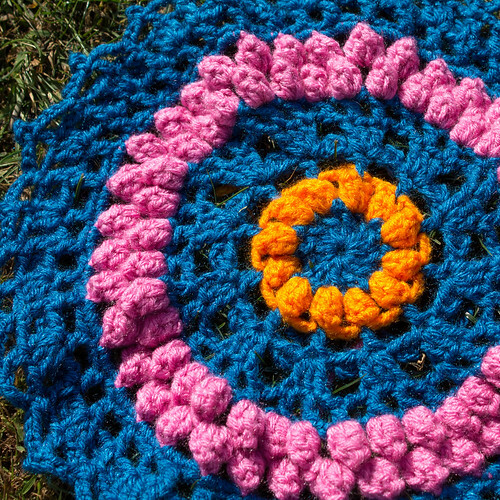 The pattern needs the stitches to be a little tighter to help make it's round shape. I love the texture that the popcorn stitches make! What do you guys think? Do you think it could make a fun modern bedspread with a bit of a crazy quilt feel? I love the fact that you are doing the experiment with so colourful yarns!!!! It looks great!!!! love it!!! It certainly gives a modern twist to a classical bedspread. Does it feel nice to be working with soft yarn and a bigger hook after all that fine work? It is so beautiful!! Love all the colors and the way they match together. Cute, pretty, beautiful! 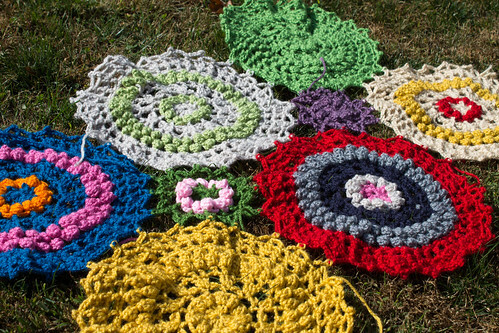 I love blankets in bold colors and made out of big motives.They remind me of quilt samplers. I have an ongoing project with 12 in squares in this style and I love it. Your blanket is going to be lovely and fun. Thanks! I can definitely see the quilt connection! I'd love to see your project! Yes! That would be a big project! 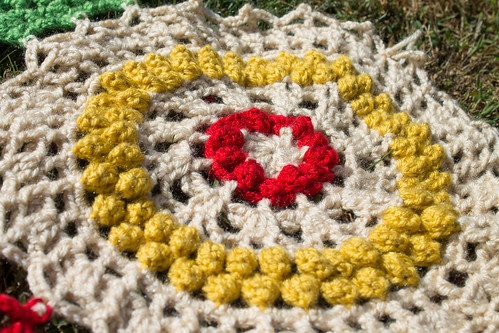 Hope you finish it, I would love to see it on a bed...pretty!